How did this loveable little rogue (picture by Joey M) get tangled up with this nasty business? Verb trans. Archaic. Middle English. When I came to write about the word beshrew this evening, I was struck by despondency. It's not been a great day, and here I am facing a word that's all about invoking evil and blaming others and calling down wickedness, etc, etc. 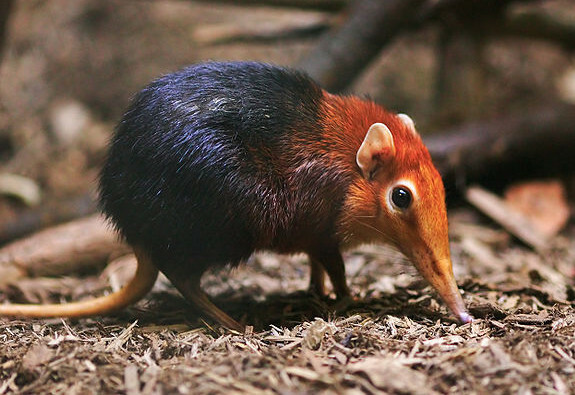 What's worse, it is actually connected to a little animal that I'm rather fond of: the humble shrew (yes, it does seem obvious that it would be to do with shrews and not, say, elephants, but I didn't realise there was a connection between the cute animal and the cursing, rather than just a different shrew word altogether). But alas no! This famous curse is (rather spoil-sportingly) not authentic, or at the very least a mistranslation of a real one. While it's construed as 'may you live in turbulent times', it's still a rather pleasing thought and, as imprecations go, would be quite a nice one to have hurled at you after a particularly rancorous game of Boggle. This rather convoluted curse kills two birds with one stone, so to speak, although again I must object to an innocent animal being caught up in all this nasty imprecatory business. The only one that could be forgiven for beshrewing the cat would by the eponymous shrew himself. As for me, once I've been eaten by the cat, all further predation seems somewhat redundant, so go ahead; see if I care who or what eats the cat. It's rather poetic, it creates a pleasing image and colour scheme in the mind, and therefore this classic Irish curse gets two anaphylactic thumbs up. 'Never beshrew upon anyone what you can more easily do yourself,' said no one, ever, but I stand by those words. It does seem a tad lazy to be calling upon the universal forces of good and evil to do this when, if you really feel that strongly about making someone sneeze and giving them itchy eyes, you can far more easily do this yourself. This would be the point that I should just shut up and walk away, but I wouldn't be able to; I would feel compelled to point out that trouble is an uncountable noun and therefore 'thousands of trouble' makes no sense at all. To be honest it was probably such pretentious pedantry that lead to me getting cursed in the first place. Will I ever learn? Are there any humorous, nonsensical or rather sweet imprecations where you're from? If so, let your fingers type freely and your comment box be filled with insightful and pithy witticisms. I guess it's short for "I hope you get a nasty case of rabies"
You can use it when you're annoyed by someone or something, usually a loud noise. I've always found it funny because all Greek people utter it in the same emphatic way, prolonging the 's' sound, as if to make sure the curse will work. when I told my teacher I wasn't going to university, he said if he were in a room with me, Hitler and Stalin, and had a gun with 2 bullets, he would shoot me twice. this isn't quite an imprecation I suppose, and unfortunately I only learnt Godwin's Law yesterday. I love your teacher almost as much as I love Godwin's Law! May beets grow in your belly is one that's always puzzled me. I mean, there are so many worse things that could grow in your belly, like deadly nightshade or a porcupine. True, but neither a porcupine nor nightshade turns your wee pink, which can be very alarming when you're not expecting it. LOL How about, "May you be as happy as a cat with rat's breath?!" I like this one Beth ... but ... is it a blessing or a curse? I mean, cats like rats don't they? So wouldn't that be like me having breath that smells like ginger beer? (I *love* ginger beer!) Or is it that I would be smelling ginger beer but wouldn't have any? Or is it a 'too-much-of-a-good-thing' kind of curse? Hang on - I can't even smell my own breath! I'm so confused by this one! Or is that the curse??? I don't know!!! Someone please end this torment!!!! As a stereotypical Canadian, I'm evidently too nice to be able to think of any particular imprecations we employ. There must not be any! "May you be cursed with the even, kind and balanced temperament of a Canadian *just* at the point in your life when you need to be assertive, pointed and a little bit nasty to someone."